It is increasingly hard to find words which accurately describe the willful blindness of the so called “science” community. How high a price has the planet and global populations already paid for the behavior of the science community? No matter how enormous the global geoengineering “elephant in the room” becomes, no matter how much destruction and devastation the ongoing climate engineering assault causes, the effects are all a big “mystery” to the “experts.” Ocean temperatures are skyrocketing along both coasts of the North American continent causing marine ecosystem collapse (see article posted further down this page). The experts correctly acknowledge that part of the warming is linked to carbon emissions, but then go on to admit “there may also be another explanation, so far undiscovered.” The seas are warming so rapidly that researchers must constantly upgrade charts. 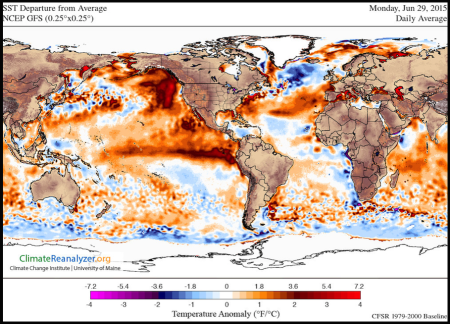 The extreme ocean warming off the coasts of North America is clearly visible in the current departure from average sea temperature map below. Climate engineering is the most dire and immediate threat to the oceans, to us, and to the planet’s life support systems as a whole. Short of nuclear cataclysm, climate engineering is the greatest threat we face. Many blame Fukushima for all the die-off of the Eastern Pacific, but there is much more to what is unfolding. The toxic heavy metal geoengineering aerosols being sprayed from jet aircraft (and the radio frequency transmissions used to manipulate them) are completely altering atmospheric convection, wind currents, ocean currents, ocean “mixing,” and the hydrological cycle as a whole. The climate engineers have actively tried to suppress the El Niño event since at least 2007. The climate engineering is forcing ocean stratification which is contributing to an increasing “canfield ocean” condition. Our oceans are dying, if the oceans die, we die. Though there are countless forms of anthropogenic damage to our biosphere, academia has so far not shown a shred of courage in regard to openly acknowledging the geoengineering assault on the planet. The recently published article below is yet more proof of this fact. It is up to each and every one of us to expose this criminal denial and thus bring climate engineering to light once and for all. Unprecedented ocean temperature rises off the Atlantic and Pacific coasts of the US may be linked to sea level rise or the recent pattern of “weird” weather. LONDON, 28 June, 2015 − Oceanographers are puzzled by an accelerated burst of warming sea that threatens the fisheries of the American Atlantic coast. Meanwhile, off the US West coast, scientists report that they have been baffled by a mysterious “blob” of water up to 4°C warmer than the surrounding Pacific, linked to weird weather across the entire country. Jacob Forsyth and research colleagues from the Woods Hole Oceanographic Institution (WHOI) in Massachusetts report in the Journal of Geophysical Research: Oceans that the ocean off the US north-east continental shelf has been warming at unprecedented levels for 13 years. Their findings came after analysis of data from sensors − called bathythermographs − dropped 14 times a year from the container ship Oleander, which for 37 years has traveled between New Jersey and Bermuda. Each detector takes the temperature of the water column as it sinks up to 700 meters. What they were startled to discover was an unexplained, and unprecedented, rise in the water temperatures that may be linked with an equally mysterious sea level anomaly: sea levels are going up, but they are going up faster off the north-east coast of the US than almost anywhere else. “The warming rate since 2002 is 15 times faster than from the previous 100 years,” says Glen Gawarkiewicz, a WHOI senior scientist and one of the authors of the report. To make sure of their perspective, the authors compared their analysis with surface data from the Nantucket lightship and other such installations along the coast, from 1880 to 2004. The new study shows that the warming is not just confined to surface waters. Although there must be some link with the steady rise in atmospheric temperatures because of global warming as a result of human-made carbon dioxide emissions, the oceanographers suspect there may also be another explanation, so far undiscovered. Off the Pacific coast, meteorologists have been scratching their heads over the appearance in 2014 of a “remarkably” warm patch − 1,500 kilometers across in every direction and 100 meters deep − that could be linked to “weird” weather across the continental US that has seen heat and drought in the west and blizzards and chills in the East. Nicholas Bond, a research meteorologist at the University of Washington in Seattle, and colleagues report in Geophysical Research Letters that what they have called “the blob” was linked to a persistent high pressure ridge, linked in turn to a calmer ocean during the last two northern hemisphere winters. The blob plays a sure role in the West Coast weather. Air sweeping across it picks up heat, and this results in warmer temperatures and lower snowpack in coastal mountains − which certainly stoke up the conditions for drought. A second study in Geophysical Research Letters links the warm Pacific puzzle to the big freeze in the eastern states in 2013 and 2014. Once again, there doesn’t seem to be a direct connection with climate change, but it raises the spectre of changes to come. “This is a taste of what the ocean will be like in future decades,” Dr Bond says.